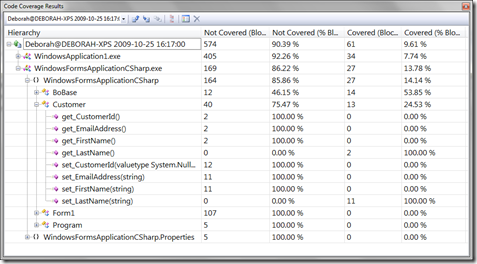 Visual Studio 2008 (Team System ONLY) provides a really nice set of tools for viewing the code coverage of your unit tests. NOTE: While Visual Studio 2008 Professional Edition has tools for building, executing, and debugging unit tests, it does NOT include the code coverage tools. Code coverage illustrates how much of the code was executed (or covered) by the unit tests. 1) Enable code coverage in the test run configuration file. Select the files on the right that you wish to view code coverage. Don’t pick your test projects; rather pick the projects containing the code that is being tested. Then click Apply and Close. 2) Run your unit tests. 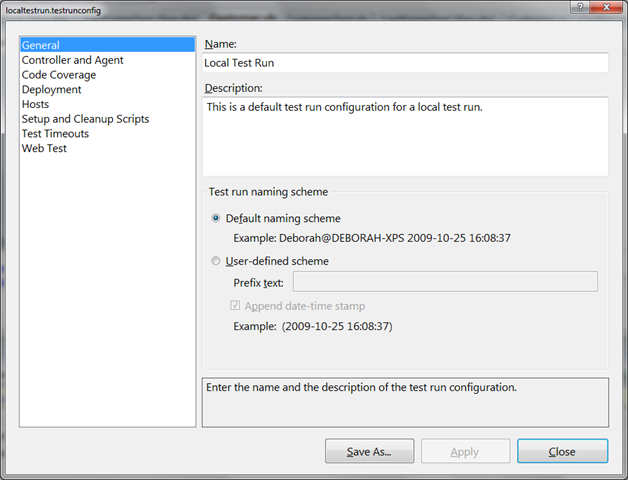 The Test Results dialog appears. See this prior post for more information on executing unit tests. 3) If the tests pass, click the Show Code Coverage Results button in the far upper right corner of the Test Results dialog. 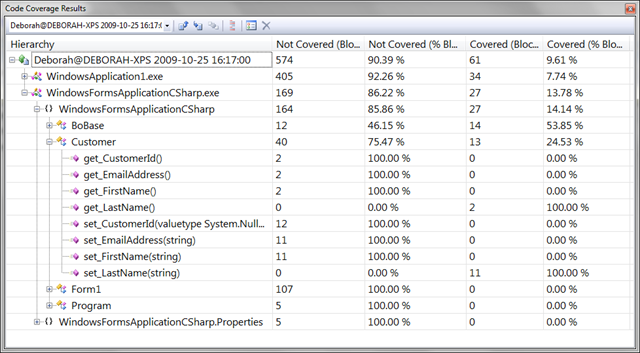 The Code Coverage Results dialog appears. 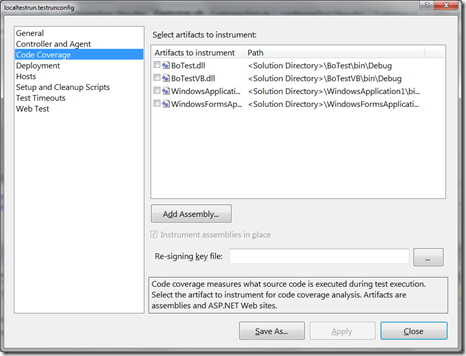 This dialog displays all of the code in all of the files you selected for code coverage instrumentation. Drill down as needed to find the desired code. 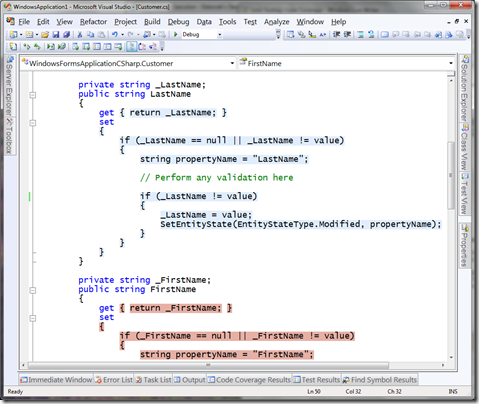 In this case, the unit test is testing the getter and setter for the LastName. Notice that the covered percentage for both the getter and setter is 100%. That means that the unit test is executing every line of code in the getter and setter. 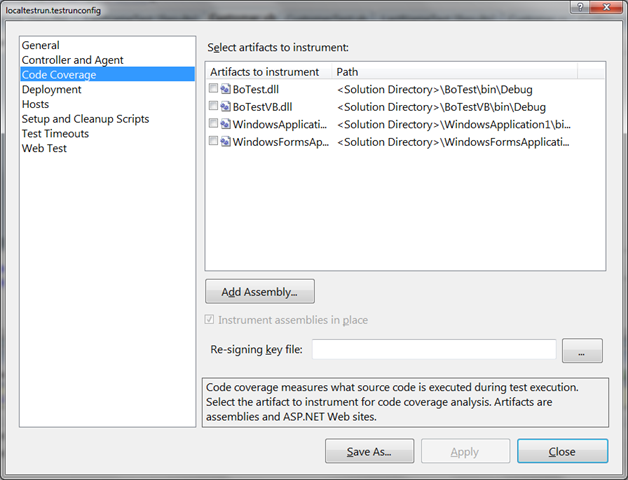 4) Double click on any item in the Code Coverage dialog to open the associated code window. Notice how the code is color-coded. 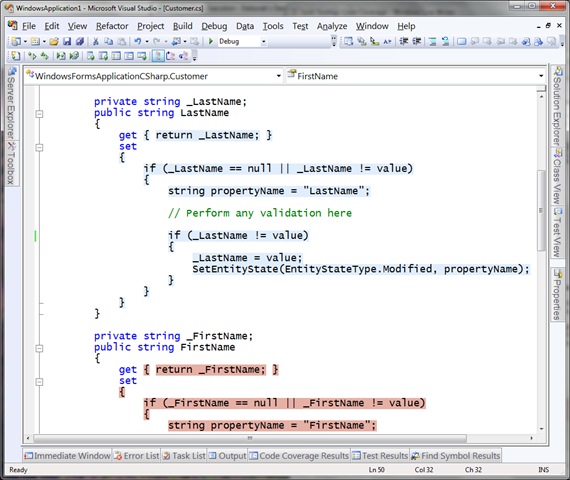 Blue shows code that was executed by the unit test. Red shows code that was not executed. Use this feature to ensure you have unit tests for each unit of your code. EDITED 10/27/09: While Visual Studio 2008 Professional Edition has tools for building, executing, and debugging unit tests, it does NOT include the code coverage tools. In the original version of this post, I incorrectly stated that code coverage tools were available in the Professional Edition. This post has been corrected. I have VS 2008 Professional, but I don’t see Code Coverage in LocalTestRun.testrunconfig (also I don’t have Controller And Agent and Web Test options). Do I need test certain projects or install something additional? My mistake. The Professional Edition has the tools for building, executing, and debugging unit tests. However, the code coverage tools are only in the Team System Edition. Thank you *very* much for pointing this out so I could correct this error. Thank you for taking your time to investigate this. I must admit I’m getting disillusioned with the unit test features in VS2008. It’s way more complex than JUnit, and seems buggy. Try debugging from a test — often you can’t step into the code called. It may be OK on a brand-new project, but when converting a mass of VB6 and adding tests, it just fails. I have a *very large* solution that originally was converted from VB6. In general, I am able to debug from the tests with no problem. However, if I have been debugging from within the tests for a significant amount of time (like all afternoon), I then find that I have difficulty. Often just existing Visual Studio and reopening the solution solves the issues and allows me to continue.